On the face of it the hotly-anticipated Lexus LF-A supercar and the iconic iQ sit at opposite poles of the Toyota spectrum. But in fact they are both benefiting from the engineering and styling talents of Gazoo Racing. The team that put the LF-A on track at the Nürburgring 24-hour race earlier this summer has been commissioned by Toyota to design a customised iQ that will be sold as a limited edition model through the Netz dealership stream in Japan. 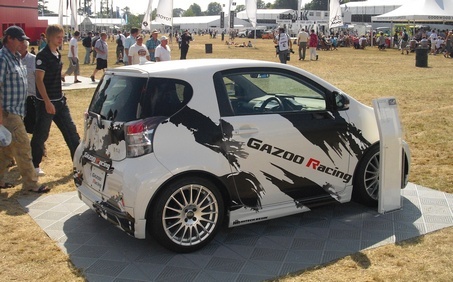 Sadly, there’s no news on it being sold outside the domestic market, but Gazoo Racing was in the UK at the weekend, where its hot iQ and the racing LF-A were rubbing shoulders with the world’s finest sporting machinery at the Goodwood Festival of Speed. Both cars were finished in the same bold, splashy black-and-white livery – a design that references the brushwork used in Japanese calligraphy. We were there to get the iQ photo you see here. The Gazoo is likely to the be the first in a series of official themed iQ versions, as Toyota is also proposing further models restyled inside and out to appeal specifically to women and young drivers. Although full technical details of the commercialised version of the iQ Gazoo have not been revealed, it will include reworked suspension to produce sportier handling, larger wheels and the kind of body kit we think suits the car’s unique proportions perfectly. Click here to see all of our photos from this year’s Goodwood Festival of Speed.